Originally from Canada and growing up in New England, you’d think that I would like snow, but the only powdery white stuff I like is the sand on our St Croix beaches! The weather here averages a balmy 85°F year round. And right now the weather is simply glorious with the Christmas winds (Trade Winds) picking up and offering a gentle breeze. The nights are cooler too in the winter, low 70’s on the hill where I live, perfect sleeping weather. Truly paradise. Rolling green hills dot the island and the azure blue ocean is our backyard. I’m blessed to live on an island where most residents appreciate her beauty and there are many organizations that work to protect our environment. Recently, The Palms at Pelican Cove, along with three other beaches in the Virgin Islands, raised Blue Flags after the year long, intense application process. This means that some of our beaches are now internationally recognized as being some of the safest, cleanest and most beautiful in the world. No one could ever accuse St Croix of being a party pooper. When it comes to celebrating, Virgin Islanders have it down. We LOVE to come out and celebrate and will look for any excuse. And of course every celebration includes live music, great food and lots of Cruzan Rum. There is Jump Up four times a year which is a huge block party in downtown Christiansted where shops have sidewalk sales, restaurants serve streetside, the Mocko Jumbies parade in the streets and there is music on every corner, literally. This weekend we have the Christiansted Boat Parade which is the largest boat parade in the Caribbean. It’s a huge family-friendly celebration topped off with a spectacular fireworks display. It really kicks off the Crucian Christmas Carnival (I can’t wait for the Three Kings Carnival Parade). In February, we have the Agricultural Fair to look forward to (I always eat my way through it – so many great local flavors). In March, St Patrick’s Day Parade is a non-stop day of fun and green where the whole island comes out to celebrate St Croix’s Irish Heritage throughout the streets of Christiansted… there are so many fundraisers and celebrations throughout the year. To keep up, check out our St Croix Events Calendar. A big part of celebrating in the Virgin Islands is listening to live music. My personal favorite is the light and cheery folk music born of the Virgin Islands when it was a Danish colony – Quelbe. To me Quelbe embodies everything pure and good about the Virgin Islands. It’s the persevering human spirit that even amidst hardship finds joy and shares joy. When you listen, you can’t help but smile and dance. It reminds me of my grandparents for some reason and that always makes my smile even bigger. Below is a short clip of the documentary “The Jamesie Project” which offers an amazing glimpse into the world of Quelbe. Jamesie is a living legend in the Virgin Islands and has worked hard to pass on the tradition of Quelbe, the official music of the Virgin Islands. Another favorite is Stanley & the Ten Sleepless Knights whose Quelbe renditions of traditional Christmas songs really gets me in the holiday spirit! Nothing says “St Croix Vacation” more than a trip out to Buck Island. Whether its spending a Sunday on a friend’s boat limin’ in the water at Turtle Beach on the West End or jumping aboard one of the many National Park certified Tour Operators for a snorkel trip through the East End Reef, Buck Island Reef National Park is not to be missed. The 176-acre island is less than a third of the protected marine park, most of it is underwater. The East end reef and marked snorkel trail is actually an underwater National Monument and home to a fantastical array of fishes and marine life. When I first moved to the island, I was lucky enough to spend weekends crewing with Big Beard’s Adventure Tours and developed a deep love for this incredible resource in my back yard. Hmm its been awhile, I think I need to take a trip out there soon! 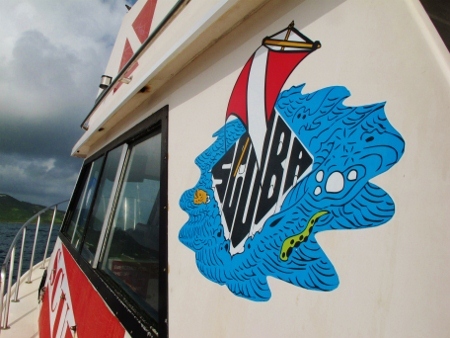 What can I NOT say about Scuba Diving on St Croix?! We have some of the best diving in the Caribbean and possibly the world. With reefs, wrecks and walls just a short boat ride or an even shorter shore dive, its easy to get spoiled here. I’ve certainly become addicted to the peace and tranquility I feel when I’m underwater peeking into the marine world. My favorite dive site is still the Frederiksted Pier where I can meander slowly among the pylons and observe the dynamic life that exists under the feet of cruise ship passengers. If you’re lucky and patient, you may even spy a seahorse or two. If you’re not a certified diver, you can try a “Discover Scuba Dive” at one of our many excellent PADI-certified dive centers like St Croix Ultimate Blue Water Adventures better known as SCUBA, the Friendliest Dive Shop on Earth. In just a couple of hours, they’ll get you diving in up to 40-feet of water. Warning, once you try it, you’ll get addicted. I did. In the ten years that I’ve lived here, in culinary terms, St Croix has really made a name for itself. The St Croix Food & Wine Experience has put us on the culinary map with some of the top chefs in the food industry and they are taking notice! The festival itself was named one of the Top Ten Food & Wine festivals in the WORLD by Forbes Travel a few years back and it just keeps getting better year after year. The reason, it highlights the culinary artists that work in our local restaurants year-round. So, even though the event happens in April – you can sample their fare any time. Our restaurants offer just about everything: local West Indian food like Roti, Doubles, Kallaloo and Goat Stew; Caribbean Fusion; Sushi (and we have the FRESHEST locally caught fish brought in almost daily); Mediterranean; American Bistro; French Continental; Thai; and much more. Check out our St Croix Dining Guide organized by area and style which is constantly being updated. Want to take home the taste of St Croix? You can purchase the cookbook produced by The St Croix Food & Wine Experience with over 100 recipes by both local and stateside renowned chefs. You’ll find celebrity chef contributors like Govind Armstrong, Michael Ferraro, Betty Fraser, Anita Lo, Tim Love, Kevin Rathbun, Gabriel Rucker, Liza Shaw, Ana Sortun, Roberto Trevino, and Just Desserts judge Dannielle Kyrillos. Island chef contributors include Elvet Carty, Jill Dedinsky, Patrick Gribbin, Leslie Gumbs, Patrick James, Jane Lansiquot, Camisha Lynch, Diane Mohammed, Angela Morales, Negust Kaza, Lance Lowman, Burton Peterson, Frank Pugliese, Joseph Stiles, Mat Vacharat, and many more. Makes a great holiday gift. Bon Appetit! When you live on an island that’s 26-miles long and 6-miles wide at its thickest point, life gets cozy with your neighbors. I think that’s why we have so many Community Organizations and so many of us are active participants. Its not only easy, but chic to support these crucial groups who offer social services and the arts. Almost every weekend there is a fundraiser of some sort adding to our festive culture. There are too many great organizations to list, but a few of my favorite community and non-profit organizations are: Sunshine Foundation, Caribbean Community Theatre, The Boys and Girls Club of the Virgin Islands, CASA of the Virgin Islands, and VICARE. Make it a point to choose something here or in your own community and lend a helping hand – volunteering is good for the soul! When I was little and fantasized about my own personal deserted tropical island, I’m pretty sure it was a premonition of Sandy Point National Wildlife Refuge that I saw. This pristine wildlife refuge is only accessible from roughly October through April and only on the weekends until 4pm during those months. Why? It is listed as critical nesting habitat for the endangered Leatherback Sea Turtle. Leatherbacks, hawksbill and green sea turtles nest there undisturbed and in abundance during the summer months. Endangered Least Terns (shore birds) place their eggs in the sand. For this reason, it is closed to the public the majority of the time and carefully monitored. And because of the light impact humans have, it remains one of the most pristine beaches in the Caribbean. There are no facilities, but they have recently paved the once treacherous road out to the beach. Pack a cooler and spend the day – you won’t be disappointed! But remember to carry out what you carry in – Leave only footprints behind. The turtles thank you. Now that I’ve been on St Croix for ten years, I feel I can say with a bit of an expert opinion that St Croix attracts some of the warmest, kindest and adventurous people I’ve ever met. In fact, I’ve lived here now longer than any other place in my life and there’s a reason… my island family and friends. Many of us have packed up and moved away from the safety net of our family. However, once on island you will find so many open hearts. We choose our family here and I’m blessed to have one of the best. I cherish watching my friends’ kids growing into kind-hearted, polite children who have been “raised by a village”. They are respectful of others and aren’t materialistic. They say “please” and “thank you”. They aren’t afraid to fall down because they know they have twenty plus “aunties” and “uncles” right there to pick them up. And we are there to pick up each other when needed too. So, the Number 1 Reason I love St Croix is you my island family and friends and I wouldn’t trade you for the world! Here’s to the next 10 years of adventures together!! … So these are just 10 reasons I love St Croix, there are so many more. Keep reading my blog to find out all about them. And let us know below what YOUR favorite things about St Croix are!! Sounds wonderful Paula u r very lucky! I too have been very blessed to have lived there twice in my life. The first time in Christiansted town and the last time in Princesse. Thank you for posting your “10 Reasons I Love St. Croix”. I could not have said it better myself.